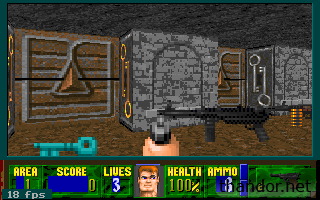 Rise of the Triad started out as an add-on to Wolfenstein 3D. 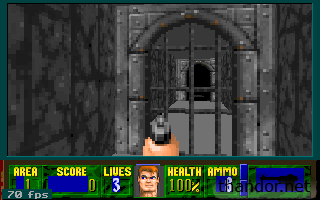 The first beta version was based on the Wolfenstein 3D engine and in the final version of Rise of the Triad (with it's own engine) you can clearly see the roots of the Wolfenstein 3D engine. You can read the original Rise of the Triad (ROTT) design here. If you look close you will see connections between Wolfenstein 3D and ROTT. 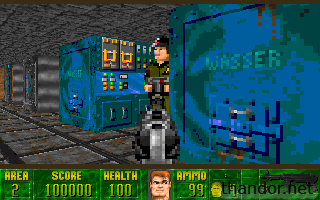 Download Wolfenstein 3D Part II: Rise of the Triad here. To preserve originality I used the DOS-version of Wolfenstein 3D as base. Please use DOSBox in order to play this game on a modern PC. My goal is to create a Wolfenstein 3D mod with the beta version in mind, and this article guides through the process of creating it. I've searched on the web for projects to create the original Wolfenstein 3D Part 2, but didn't find any or just idea's that never spun off. Too bad, so I tried to start it on my own and to get Wolfenstein 3D running with the original graphics and such. I will use Wolfenstein 3D as base, rather than using the ROTT-source because the original game would've run on the Wolfenstein 3D engine as well. 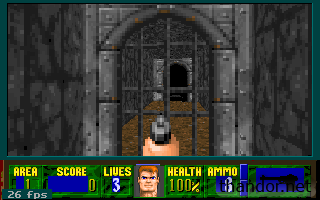 Rise of the Triad Wolfenstein 3D: Part II screenshots. I documented a few steps in the process of creating this game. Not every bit is documented but this will give you a pretty good insight of what I've done to create the game. Great editor for Wolfenstein 3D. Used to extract original ROTT textures. The original textures are 64px by 64px. Apogee supplied a lot of images but not everything. The enemies don't have a running/shooting texture. In order to create something as original as possible I will use the original textures and fill up gaps by using textures from the released version Rise of the Triad. Some of the models we're already done by other people. Thanks go out to RGamesINC, Majik Monkee, Justin, The Great Wasabi, Conner94 and my very own brother. I could not find the red officer model thus I decided to make it on my own. My brother was of great help here. 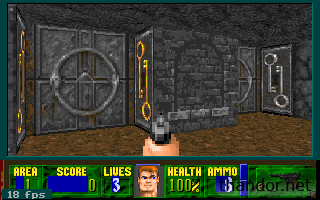 The engine of Rise of the Triad is superior compared to Wolfenstein 3D in a few aspects. To overcome this I will change the Wolfenstein 3D source code. Thanks to the well known 'people of the Internet' for the tutorials! Note: I wrote this when I started developing with the original Wolfenstein 3D source, whereas the final version has been rewritten (again) from scratch using Chris' Memboost.zip. Source may vary! You can also add number 103 and 104 which are even more speedier but I didn't need them for now. At last but not least you have to place a wall and load up the textures. I used 'Grey wall 1' and texture 70, 72, 74 and 76. Don't forget to insert the object 'animation fast' right over the wall. After implementing this the fireplace started working! In order to use transparent walls I've implemented the directional sprites which I based on the Chaos Software's 3D directional sprites tutorial. Unfortunately the link to his website doesn't exist anymore. Because the directional sprites eat up some memory I had to remove wolfhack.c and whack_a.asm from the project. In Borland C go to Window > Project and remove both files. By using sprite number 49 I did overwrite the vines sprite but I wasn't planning on using that texture anyway. Current ingame progress including a see-throught 'wall' (Directional 3D sprite)! A great improvement but bad for performance! I used this tutorial to get floor and ceiling. 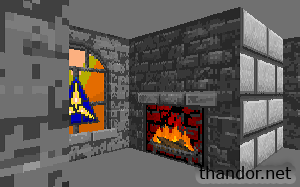 I doubt if the original idea of Wolfenstein 3D Part II : Rise of the Triad also included the floor/ceiling textures, but I decided to implement them for better looks. Because the floor/sky textures use up roughly double the number of cycles I added an option to switch off the floor/sky textures on-the-fly. In-game go to the Menu > Options and toggle the 'High Detail Enabled' setting. Changed '#define DOORWALL (PMSpriteStart-8)' to value -10. I did this because I added two extra textures. Including nice side textures ('doortracks') with corresponding key colors. The original Rise of the Triad files have two different HUD's. I will use the thin HUD (see image) because I guess this one is 'newer'. 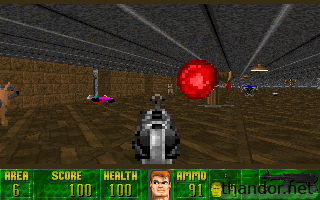 The thick HUD seems more like the original Wolf3D HUD with different colors. Because the HUD is smaller I have to change the source to draw a smaller HUD and to place all the items on the correct spot. In WL_DEF.H I've changed #define STATUSLINES 40 into 30. This draws a smaller HUD. - Change LatchDrawPic (x,y,picnum); into LatchDrawPic (x+1,y-5,picnum); in order to change the B.J. head. - Changed the keys according this tutorial: Poet's Source Code Tutorials and created the proper key images. Perhaps I haven't mentioned all the changes I did here. In case you struggle to get the HUD in proper shape please read the source code thoroughly and follow up any leads to the HUD one by one. I disabled the PG13 screen by commenting the void PG13 section in WL_INTER.C. I did not comment one VW_FadeOut(); line because I wanted to keep the fadeout effect. In order to re-design the signon screen I followed this tutorial. To re-shape the 'Skill selection' menu I've modified WL_MENU.C: changed the values of 'void DrawNewGameDiff(int w)' and 'void DrawNewGame(void)'. This is a solid brown color that matches the intro screen after importing it into Wolf3D. The original colors of Rise of the Triad are a tad different but because I did not fiddle with the palette some colors are different in my version. 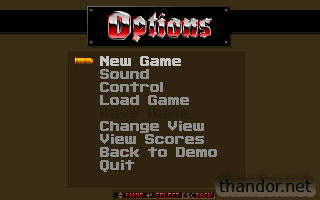 I used the original Wolf3D VGAGraph menu headers because the original introscreen also features the Wolf3D style font. 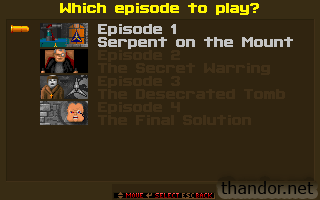 In order to disable the last three episodes I commented the NewEmnu.active = and EpisodeSelect parts in the 'if (!findfirst("*.WL6",&f,FA_ARCH))' section. The brown main menu with just four episodes visible. 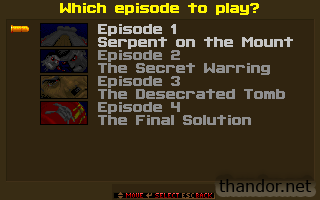 In the final version it's only possible to select the first episode. 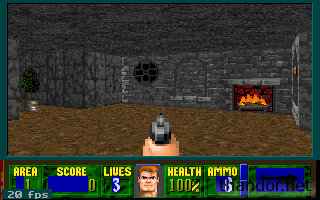 The original Wolfenstein has an metal-like color as border, fade effects and in the screens between levels. This doesn't fit with the brown color of the menu. - In WL_MENU.H change #define VIEWCOLOR 0x7d in #define VIEWCOLOR 222. At last but not least I changed all the VGAGraph's and painted new brown images. I enjoyed creating this version of Wolfenstein 3D. The first bits of modification are fairly easy. It doesn't need much to see that the game is modified (different maps, textures and sounds). Lot's of source code is available and well documented. After the base of the game is ready the bug-hunting, level design and last bits have to be done, and those last bits are worst! Random crashes are difficult to locate, adding functionality that is not documented can be time consuming and after a few levels it's getting harder to find inspiration for the next level. Nevertheless I'm satisfied with the result. Because I was struggling with bugs I decided to rebuild everything from scratch. I copied a fresh version of Wolfenstein 3D, used the optimized Wolf3D source ('memboost.zip') as base and added the new content step by step. Each subversion had a new feature (ROTT01; textures, ROTT02; sprites; ROTT06; Moving walls) so in case I run into bugs I know which modification is to blame. A few other tutorials will be more difficult for the unexperienced coder if you use the 'memboost' source code, because few parts of the code are quite different. You have to make sure that DOSBox has enough cycles. The cycles are shown in the title-bar of DOSBox and you can increase them by pressing CTRL+F12. To decrease press CTRL+F11. I just tested the game and you'll need about 25000 cycles to make the game playable (default from DOSBox is just 3000 cycles!). To improve stability of the game it's best to set the cycles to 25000 before starting the game. If your PC is not fast enough to run 25000 cycles you can go to the Options menu and unset the 'High Detail Enabled' setting. This will remove floor and sky textures and will greatly improve performance. ECWolf looks good/authentic! It seems you have some coding work left in order to get the 3D-sprites correctly. Also note that I made several other changes (i.e. 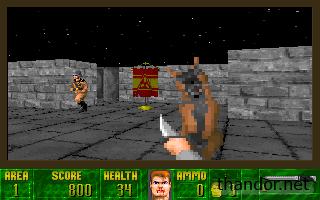 dogs have random walking speed upon spawn, soldiers rarely drop extra blood, exit-points in RoTT-style and animated sprites). That's sweet i did managed to fix up the level a bit and updated it to make it into what it's suppose to be. I mostly fixed all the problems with the level design and just made into a exact replica of the dos level. Do you also have source-code for the ECwolf version you are using? Several changes I did to the original Wolfenstein can only be done in source code. Your mod looks cool. I was wondering though, would it be possible to release the source code in order to convert the project to ECWolf? I wouldn't mind helping if you don't have the time to do so. Email me if you're up for it.